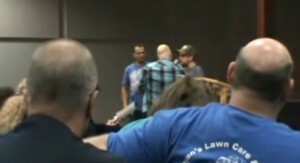 TULSA, Okla. — A man confined to a wheelchair due to his struggles with cerebral palsy gave a face-to-face warning to ‘faith healer’ Todd Bentley this past Thursday in front of a live audience that had gathered for Bentley’s healing crusade. Justin Peters, who runs Justin Peters Ministries in Oklahoma, attended the event to rebuke Bentley over what he believes are deceptive healing practices. Not knowing that he was about to be excoriated, Bentley handed the microphone over to Peters. Peters then began to quote from Matthew 7, which speaks of those who do wonders in God’s name but live lawless lives, in presenting the rebuke to Bentley. “Which man?” Bentley asked, standing adjacent to Peters. “You,” Peters answered, who continued preaching until he was escorted off stage. Peters is certainly not the first to chastise Bentley, who is plastered in tattoos, facial piercings and various pieces of jewelry. Over a decade ago, reports began circulating that Bentley was becoming violent on stage and claiming that the Lord told him to do it.